A statue commemorating the iconic photo of a sailor kissing a nurse, called the “Unconditional Surrender,” was vandalized shortly after George Mendonsa, the World War II veteran in the photo, died at 95-years-old. 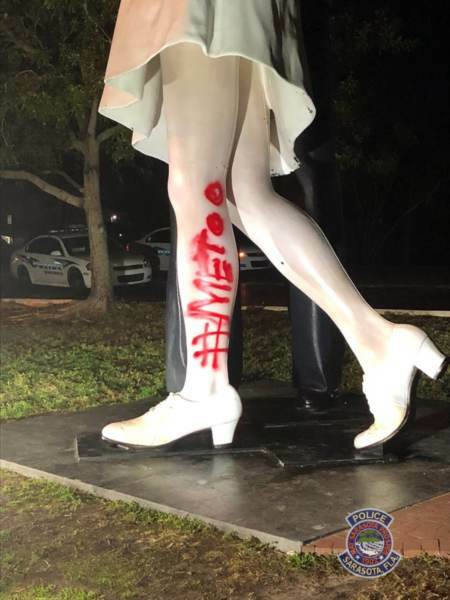 The statue in Sarasota, Florida, was targeted by an activist who wrote “#MeToo” on the woman's leg with red spray paint. 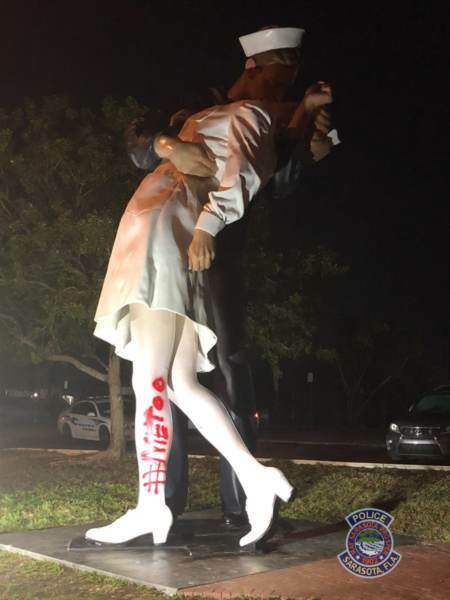 “This morning, February 19, 2019, at approximately 12:53 a.m., Officers with the Sarasota Police Department were dispatched to the intersection of North Gulfstream Avenue and Bayfront Drive reference to an unknown individual spray painting ‘#MeToo' on the Unconditional Surrender statue,” the Sarasota Police wrote in a statement. The statement added that they could not find any spray paint cans at the scene and no surveillance video captured the vandal. The police department estimates the approximate damage is going to cost more than $1,000 due to the large area the graffiti covers and the resources needed to repair it. The sailor in the photo that the statue is based on passed away on Sunday. He had been suffering from severe congestive heart failure and would have turned 96 on Tuesday. The police are asking anyone with information to call the Sarasota Police Department Patrol Division at 941-954-7025 or leave an anonymous tip with Crime Stoppers by calling 941-366-TIPS. The post Iconic Statue of ‘Kissing Sailor' Vandalized With #MeToo, Just Days After the Sailor's Death appeared first on The Gateway Pundit. Honestly sick. And -- (once again) -- in this day and age we're living in.. it's not surprising. We should start targeting the left's favorite iconic statues right back! Rest in peace, Mr. Mendonsa.